Mission La Soledad. Courtesy of Santa Barbara Mission Archive-Library. Mission Soledad founded in 1791 by Father Lasuén, was built to assist the other missions of northern California. The Spanish word Soledad, means solitude or loneliness. 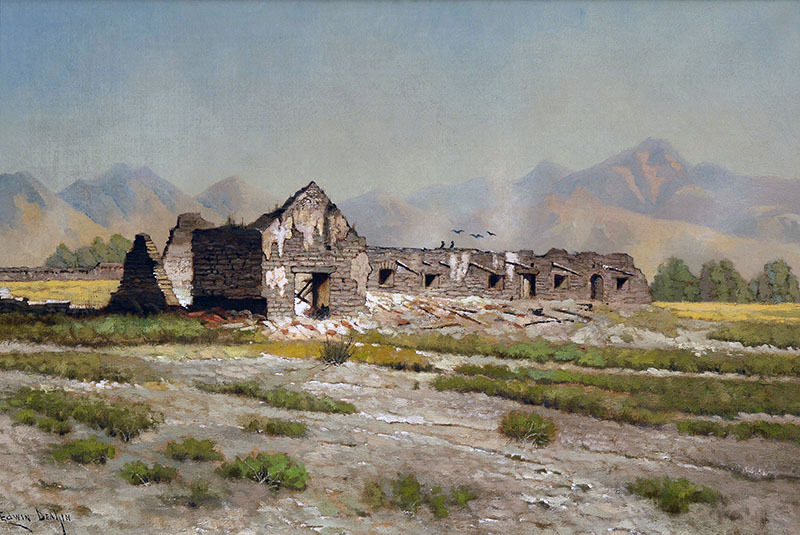 Built in the sparsely populated area of central California, the feeling of isolation is evident, but founder Father Lasuén didn’t name the mission after its surroundings, rather to glorify Our Lady of Solitude, one of the sacred names for the Virgin Mary. Speculation abounds as to whether its number thirteen in the chain is related to the bad luck it has experienced. Massive floods from the Salinas River ravaged the mission many times. These grounds, still scattered with the ruins of the mission’s adobe walls that once stretched the entire complex, are a constant reminder of how difficult life must have been at this remote and desolate mission. The church, originally located at the east end of the padres quarters was destroyed by floods in 1828. Rebuilt in 1832, this quite simple chapel depicts the religious tone surrounding Mission Soledad. Although a replica bell now occupies the wooden beam to the left of the church entrance, the original mission bell can be found inside the museum. Like all missions, the fourteen stations of the cross adorn the walls of the mission church. Each church has a different version of the fourteen stations, or the journey of Jesus to Golgotha where he was crucified. These fourteen religious symbols are rare originals. After the flood of 1828, the mission was hit by an epidemic which killed off many of the Indians. Then, Father Vicente Francisco de Sarría died causing many Indians to leave in hopes of finding a better life elsewhere. Secularization was particularly hard on Mission Soledad, with the property serving as a ranch house, a grocery store and then a restaurant, eventually sitting abandoned for almost one hundred years until it was sold in 1946 for a mere eight hundred dollars. Eventually, the land was returned to the Catholic Church and a restoration effort began with the help of the Native Daughters of The Golden West. The group restored the small chapel and the covento wing, which now serves as the mission museum. Mission Soledad; small in size, but still a well maintained part of California history. Like all missions, the 14 Stations of the Cross adorn the walls. From US-101 : Exit Arroyo Seco Road and turn right. Turn right again onto Fort Romie Road. 10a - 4p daily, closed Thanksgiving, Christmas, New Year's Day, Easter, and 4th of July. Please call 831-678-2586 for further information. Weddings. Please call 831-678-2586 for information.